ENGLISH LEATHER PERSONAL size hand made organiser planner addict binder journal The Midnight Cat. Handmade leather scarf ring woggle.clip clasp Dragonfly. Blue, or made in any of the colours we offer. 8oz Hip Flask Tree of Life 2 tone Cordovan brown,leather and stainless steel. Can also be Custom Made. Chi Rho Leather scarf neckerchief ring woggle clip clasp. .
TSUBA IAIDO IAITO Katana thick die cut leather spacer guard protecto. Faced with Boar Skin and Horse hair Tassel. Limited quantity. 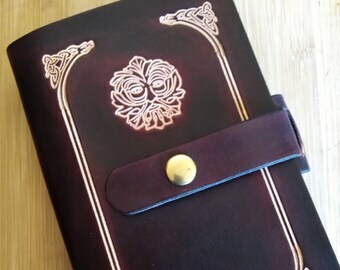 Handmade Leather Personal Size Organiser/Planner/Binder, Napoleonic Bees and Hive design by Cordwain Higgler. Hand made HIP FLASK, Pentagram, 3 oz Purple 2 tone leather and stainless steel. Can also be Custom Made. Hand made HIP FLASK Witch on Broomstick, 3 oz Black 2 tone leather and stainless steel. Can also be Custom Made. HANDMADE LEATHER belt SECATEUR/Pruning Snips Holster or Holder. Bee design. Beautiful, just as described and received promptly! Come in a great time! Quick delivery and friendly service, exactly as described, absolutely chuffed with it. Thanks! For purposes of EU data protection law, I, Guy Mather, am the data controller of your personal information. If you have any questions or concerns, you may contact me at contact@cordwainhiggler.com.